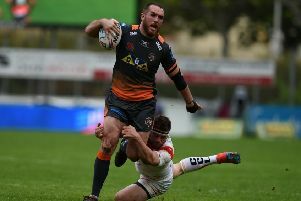 Frankie Mariano joined Featherstone after leaving Castleford at the end of the 2016 season. FORMER Castleford Tigers teammates Frankie Mariano and Scott Wheeldon are both looking forward to facing their old club in Featherstone’s first warm-up game at the Mend-A-Hose Jungle on Boxing Day. Wheeldon, a close-season signing from Sheffield Eagles, made 42 appearances for the Tigers in 2014 and 2015. Fellow forward Mariano, who has now resumed training following a short break after playing for Scotland in the World Cup, made 40 appearances for the Tigers and played in the same team as Wheeldon before he left at the end of the 2016 season and joined neighbours Featherstone. “The World Cup campaign was a great experience. We had a tough pool but I enjoyed every minute while I was there. It’s now good to be home,” said Mariano. “The Championship is getting harder every year and we need these pre-season games. That’s where we get our game plans right and playing against the best will bring out the best in us. “I’m looking forward to playing against my old team Castleford. Wheeldon is also relishing his return to The Jungle. “I am looking forward to getting back out there and playing, especially against one of my old clubs on Boxing Day,” said Wheeldon. “Castleford are a very good side. They throw the ball about and like to play good rugby and that’s also one of our goals next season to be able to entertain a bit more. Wheeldon expects next season’s Championship to again be highly competitive as Featherstone aim to nail a top-four place for a third successive season. “Toronto are coming in and they are strenthening. Obviously, it’s like for like with Leigh being relegated and Hull KR going up so it’s going to be another really tough season next year,” he added. “We will have to be on our toes each week whoever we play. There are no easy games.